It was warm enough to sketch outside for the first time today. This is a section of a bigger sketch that I did and a reminder to myself about the importance of planning. The full sketch has a big dead area in the middle which I would have seen had I done a value sketch before rushing into the painting. But the light on this upper balcony was so perfect, the shadows from the power lines were great, the bench on the street was free and I wanted to paint! I will be taking a short break from posting during this Easter weekend so I can focus on my illustrations for the children’s book I am working on. I hope you have a nice Easter, Passover, equinox, or whatever it is you celebrate. See you in April! It was a cloudy sky today but at just the right moment the sun came out and contributed some shadows to my sketch. I was only partway through my drawing but I dropped the pencil and took out my paints. 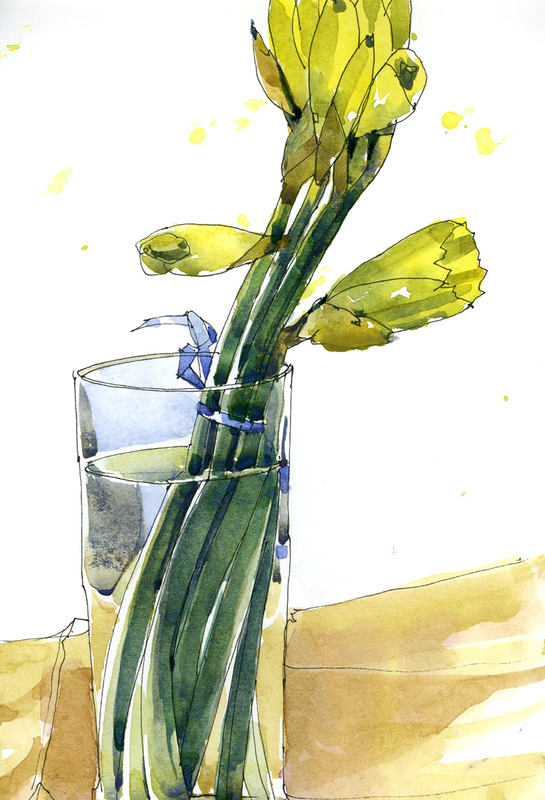 It will only be a matter of weeks, or maybe days, before the whites in my sketches are replaced with yellowish-green. How amazing is this? While I was sketching in my car today I was listening to a radio interview with a sketcher. 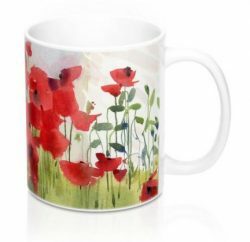 On CBC’s The Current, Anna Maria Tremonti was interviewing Janet Hamlin, an artist who has been sketching the U.S. Military Commissions at Guantanamo Bay, Cuba since 2006. It’s a fascinating interview and if you like her sketches, there’s a book of her work coming out in October called Sketching Guantanamo: Court Sketches of the Military Tribunals that promises to be a compelling read. Wow, painting yellows is so difficult.The changes of colour are so subtle and there are really no dark areas in the flowers. Just yellow or lighter yellow. 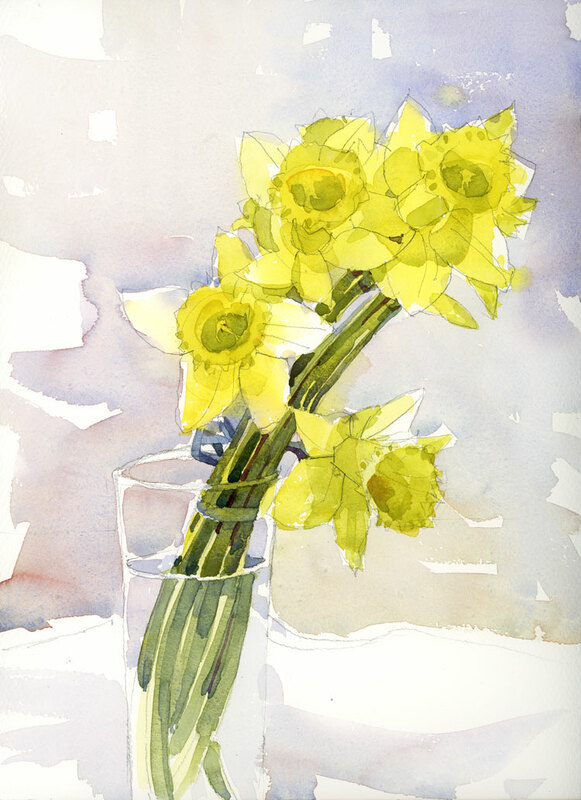 I used a limited palette of three very transparent hues for this: aureolin yellow, cobalt blue and rose madder. 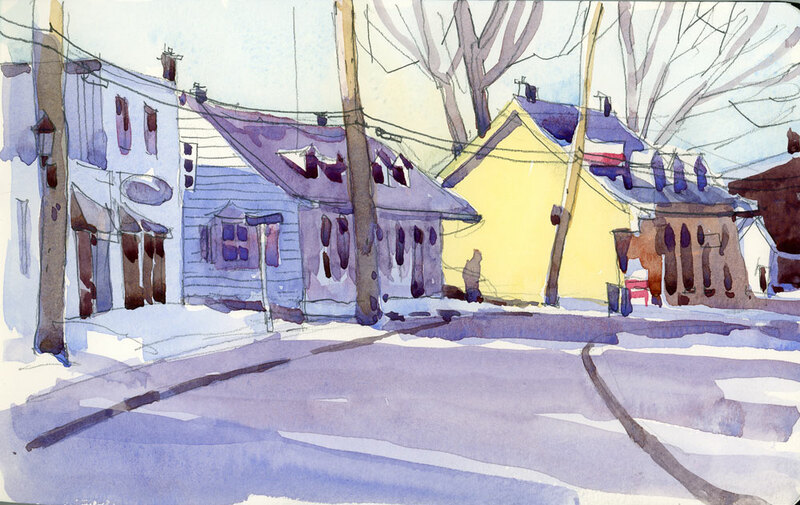 I am in awe of my Australian friend and fellow Urban Sketcher Liz Steel. She can sketch and eat at the same time. I’ve seen her do it and more importantly she did it outside, at night, with not much light to paint by, while having a conversation. 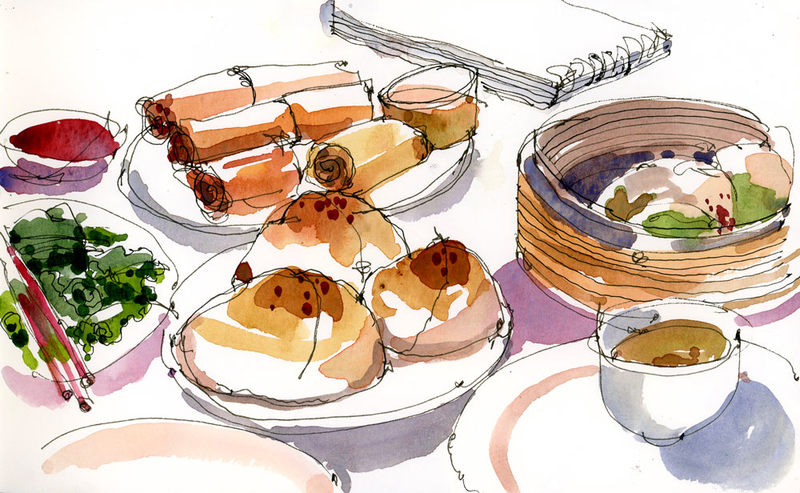 This month’s sketch outing for Urban Sketchers Montreal was in Chinatown where we met for some dim sum and drawing. This “drawing while attempting to eat” is pretty new for me. Yes, I do paint food but usually before I cook it. 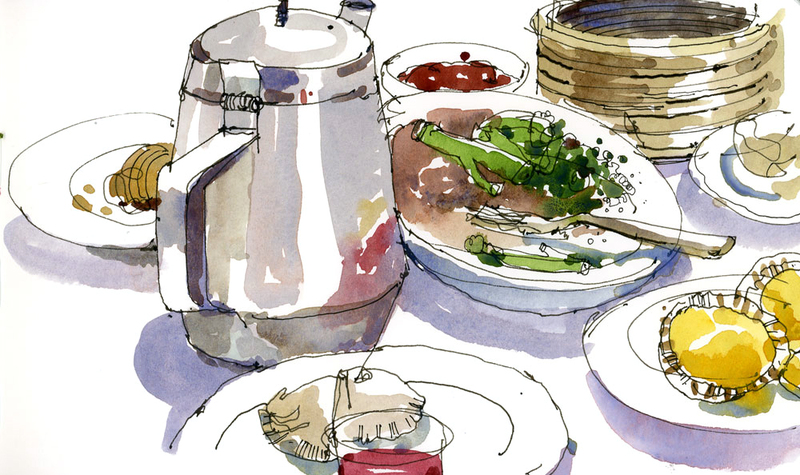 On her recent trip to Singapore, Liz Steel recorded almost every meal she ate — and there were many — with her Singapore sketching hosts. I know from meeting her that she’s a fast sketcher but it’s still a mystery to me how she gets any eating done or at least any eating while the food is still hot. To add to the discomfort of having my palette on my lap (didn’t want to get paint on the white tablecloth!) I also tried to eat someone else’s food thinking it was from one of the communal plates and shortly after I dropped egg tart all over my palette. Hats off to you Liz. You are the queen. Someone told me recently that we’ve had 30 fewer days of sun this winter than we usually have in Montreal. I tried to confirm that but couldn’t find any reliable news articles about it. In any case, that could explain why I needed to paint some sunshine today. At this time of year I start longing for something from the garden. Something that isn’t wrapped in plastic and that still has a little bit of dirt on it or perhaps a bug hidden in the leaves. Growing season in Montreal is still a long way off but the chard in the grocery store was close enough for me.